Yorkshire Terriers were originally called Broken Haired Scotch Terriers. They were renamed Yorkshire Terriers to reflect where they originated from in Yorkshire, England. Yorkies (as they are affectionately called) were originally known as “ratters.” They were great at chasing down and killing rodents and also going into bushes to catch rabbits. It was during the Victorian age that Yorkies came into fashion as pets. They are tiny dogs with a big attitude. Yorkies seem utterly fearless! They look like lapdogs but are so energetic that they can run up and down your hallways with such playfulness all day long. It’s such a delight to watch them. 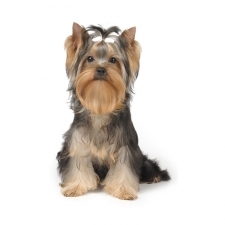 Yorkies are very social little dogs, and they enjoy being in the middle of family life. Of course, you must teach young children how to properly play with this tiny dog to avoid any unintentional injuries. Yorkies should not weigh more than seven pounds, although, as with any dog, you will sometimes see a variation in their weight. Their coats are usually black & tan or blue & gold, and sometimes change to a silver color the older they get. It’s good to comb out their coats at least every three days to keep their long flowing coats from matting. Yorkies also have dental problems, so it’s wise to brush their teeth several times a week. The Yorkshire Terrier is the number one most popular dog registered with America's Pet Registry Inc. Some celebrities who have owned or own Yorkies are Joan Rivers, Justin Timberlake, Hillary Duff, Britney Spears, Brett Favre, Bruce Willis and Paris Hilton.